To see a large version of this paper, click HERE! Before the Helena crossed the equator on her southward shake-down cruise to Buenos Aires, Captain M. B. De Mott handed over his ship to King Neptune, and automatically became a "shellback." It will be recalled that Captain John Rankin, of the U.S.S. Phoenix, did the same thing a year ago--and also escaped a greasing. About three hundred "pollywogs," it was learned, were given the "once over" when crossing the line. The Neptunian rites consist of close hair-crops, greasing, and painting. It's a lengthy ceremony, especially on big warships. After the initiation process has been gone through, Uncle Sam's sailor boys are known as "shellbacks." 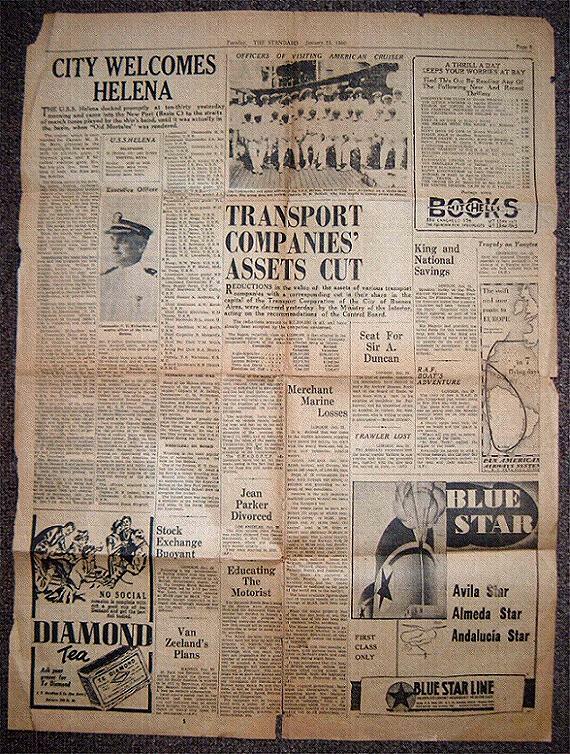 The Neptunian certificate is reproduced in to-day's issue on "The Standard." (Ed note: the page containing a copy of the certificate was not among the papers that Joe Desch donated. To see Joe's certificate click HERE). To see pictures of the Helena's Shellback cermony, click HERE. ARRIVAL OF U.S.S. HELENA---A large crowd gathered at Basin C. of the New Port yesterday morning to welcome the American light cruiser Helena which was its first visit to Buenos Aires. She is shown here on a shake-down cruise and attracted a great deal of attention, in view of her many unusual features. Above the cruiser is seen entering the dock. The other picture, taken after the Helena's arrival, shows a portion of the crowd admiring the visiting warship. To see a large version of pictures in this paper, click HERE! THE U.S.S. Helena docked promptly at ten-thirty yesterday morning and came into the New Port (Basin C) to the straits of march tunes played by the ship's band, until it was actually in the basin, when "Oid Mortales" was rendered. The cruiser, which is commanded by Captain M. B. De Mott, glistened in the bright sunlight. She is armed with 15 six-inch guns; 3 five-inch guns, and 8 50-calibre machine guns. She has one gun less than the total of both the Ajax and the Achilles. The Helena, earlier in the morning, before docking, exchanged calls with the Argentine gunboat Rosario, after which the Argentine ensign was hoisted at the main and a twenty-one gun salute was fired. When the salute had been returned and the Helena was within 1000 yards of Rosario, the Argentine ensign was hoisted at the fore and a thirteen-gun salute fired to the rear-admiral. The ensign was hauled down with the last gun of each salute. When the vessels were bow to bow in passing, the Helena's bugle sounded for attention; the band played the Argentine National Anthem. Immediately the vessel was berthed and the gangways put into position. Captain William D. Brereton, United States Naval Attache, boarded the ship and was followed by Hon. Norman Armour, Lieutenant Ricardo Castagneta, representing the Minister of Marine, and Lt. Angel R. Vaccari, assigned as Captain DeMott's aide-de-camp, and general liason officer. Pressmen who were courteously allowed to board the Helena were received by Commander C. G. Richardson, executive officer in the absence of Captain DeMott, who is indispensed and confined to his bed. Commander Richardson and Lt. Commander Duck, who was in Buenos Aires in 1934 when the U.S.S. Tuscaloosa visited the port, answered reporters' questions and said that the Helena is a sister-ship to the St. Louis and, with minor differences, is patterned on the same principle as the Phoenix, with a square stern. Captain DeMott has not been in Buenos Aires before, but has served in South American waters previously on another unit of the United States fleet. Some of the younger officers have been in Argentina during the visits of the U.S.S. San Francisco; Tuscaloosa, and Quincey. Fifty percent of the ratings have been taken from naval training camps and have not previously been in foreign waters. Many of these men were eager to get ashore and explore the capital, facilities being given by the commander to allow as many as possible to leave the vessel. Captain DeMott graduated from the United States Naval Academy in the 1909 class and Commander C. G. Richardson the 1915 class. He was formerly gunnery officer of the Tuscaloosa. 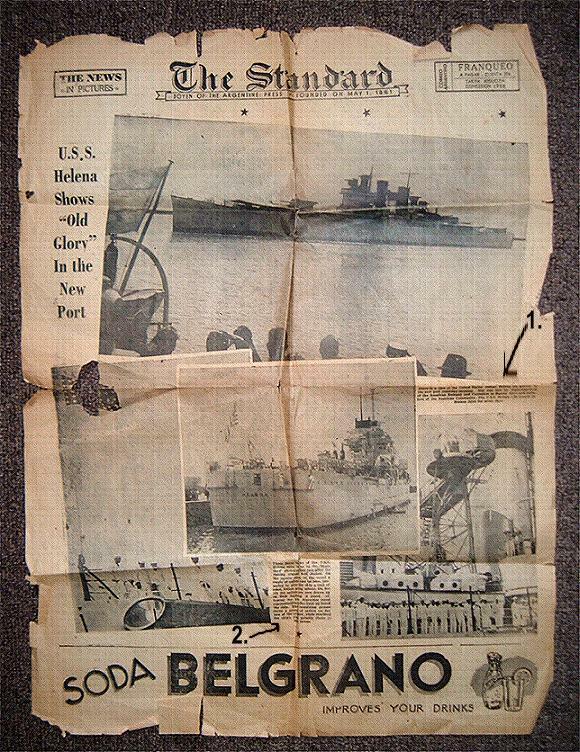 The Helena left Norfolk, Virginia on January 3 and proceeded to Guantanamo Bay, Cuba, whence it made the direct journey to Buenos Aires. She was built at the New York Navy Yard, the keel being laid on December 9, 1936, was launched in August, 1938, and commissioned in September, 1939. Her length is 608 feet, 4 inches; beam 61 feet 7 3/4 inches; draught 21 feet, 9 inches; displacement 10,000 tons; designed speed 32 knots, and is propelled with geared turbines. On board there are 44 officers, 725 enlisted men, and 41 marines. The Helena will remain in Buenos Aires until next Sunday, when she will go to Montevideo and later to Brazil. Yesterday, prior to the official calls, several members of the American colony visited the vessel to pay their respects to Captain DeMott and his officers, and these included Embassy officials Commander Kirkwood Donovin, and Mr. E. P. Clarendon. Mr. Owen L. Thomas, vice-president of Moore-McCormack Lines. Inc. also paid a visit to the vessel. Last evening Captain Brereton was host at his private residence to the officers of the Helena, when a cocktail party was given in their honour. Today, the Hon. Norman Armour will entertain the officers to a luncheon at the American Embassy, while this evening an opportunity will be afforded the local American residents to meet the visitors when a cocktail party and buffet supper will be given at the American Club under the auspices of the American Society of the River Plate. Captain M. B. DeMott, U.S.N. Commander C. G. Richardson, U.S.N. Lieutenant Commander D. H. Johnston, U.S.N. Lieutenant Commander J. A. Morrow, U.S.N. Lieutenant Commander I. T. Duke, U.S.N. Lieutenant Commander E. C. Buerkie, U.S.N. Lieutenant W. S. Veeder, U.S.N. Lieutenant J. B. Fox, U.S.N. Lieutenant E. O. Davis, U.S.N. Lieutenant J. L. Chew, U.S.N. Lieutenant C. O. Cook, Jr. U.S.N. Lieutenant P. K. Will, U.S.N. Lieutenant A. J. Smith, U.S.N. Lieutenant (junior grade) J. L. Baird, U.S.N. Lieutenant (junior grade) P. L. Folsom, U.S.N. Lieutenant (junior grade) W. C. Boles, U.S.N.R. Ensign H. W. Baker, U.S.N. Ensign R. D. Mugg, U.S.N. Ensign R. D. Sampson, U.S.N. Ensign M. T. Tyng, U.S.N. Ensign R. L. Helm, U.S.N. Ensign F. E. Moen, U.S.N. 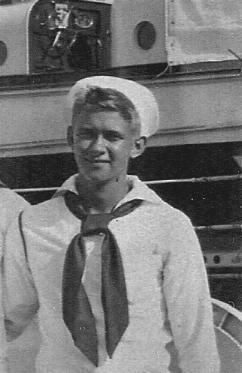 Ensign G. S. Parrett, U.S.N. Ensign D. H. Pope, U.S.N. Ensign L. S. Robinson, U.S.N. Ensign E. B. Roth, U.S.N. Ensign W. C. Wells, U.S.N.R. Ensign W. K. Linnerooth, U.S.N.R. Ensign R. W. Fleck, U.S.N.R. Commander P. P. Maher, Medical Corps, U.S.N. Lieutenant (junior grade) R. F. Redden, Dental Corps, U.S.N. Lieutenant Commander F. M. Hook, Supply Corps, U.S.N. Chief Boatswain R. W. Coffey, U.S.N. Chief Gunner A. Anderson, U.S.N. Chief Electricion A. W. Kerschner, U.S.N. Chief Radio Electricion W. M. Thomas, U.S.N. Chief Machinist D. L. Jones, U.S.N. Chief Machinist W. M. Smith, U.S.N. Chief Carpenter N. Mazzarella, U.S.N. Chief Pay Clerk T. M. Welch, U.S.N. Acting Pay Clerk R. A. Hendry, U.S.N. Captain T. A. Wornham, U.S.M.C. Second Lieutenant R. B. Church, U.S.M.C. Some of the Helena officers are veterans of the world war. The "skipper" Captain M. B. DeMott, Commander C. G. Richardson, Lieutenant Commander D. H. Johnston, and Commander P. P. Maher, of the Medical Corps. were awarded Victory Medals for foreign service. Commander Maher proudly displays the Marine Expeditionary Force Medal. He was at one time surgeon on the U.S.S. 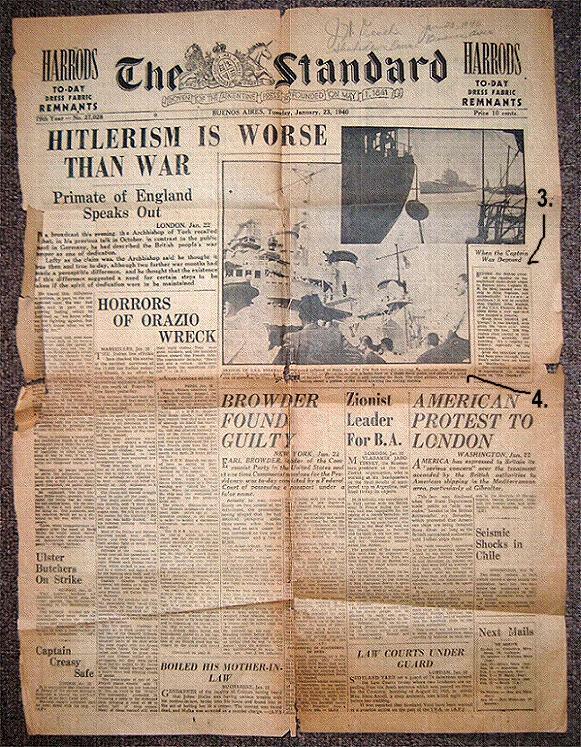 Dolphin during the world war. Wrestling is the most popular form of recreation among the boys on the Helena. One of the fireman, C. T. Dean, had the misfortune to break a leg during a recent wrestling bout. Shortly after the Helena had an ambulance from the Argentine docked in the New Port yesterday, Naval Mechanical School drew up alongside the cruiser. The injured man was carried on a stretcher to the waiting vehicle and taken to the Naval Hospital for treatment. Above is a view of the United States cruiser Helena on arrival in the port yesterday morning. She was met by representatives of the American Embassy and Consulate in Buenos Aires and members of the American Community. The U.S.S. Helena will remain in Buenos Aires for seven days. These three views of the U.S.S. Helena were taken just after the visiting cruise had docked. On the square stern of the vessel a couple of sailors can be seen, preparing to give the ship a coat of paint, before going ashore. On the left the sailors are seen drawn up on deck forming a guard of honor for the Argentine naval representatives who went on board the ship. The remaining picture shows a group of sailors on the bow of the cruiser, while overhead the ship's flag proudly floats in the breeze.